Since QE3, critics within and outside of the Feds have been calling for inflation expectations to rise. For example, within the federal Reserve Bank of Dallas President Richard Fisher said the central bank�s third round of bond purchases would probably fail to create jobs while risking higher inflation. Nobel prize winning Krugman on the other hand argues Bernanke should be doing more by raising the Fed's inflation target from around 2% to 3-4% for the next 5-years to spur job creation and growth. How can you figure out who is right and who is wrong? The best source of information is to check out the US Treasury Yield Curve. This curve embodies market expectations and is arguably the best source of information avaibale. In the following chart we back out inflation expectations from the Nominal and Real Rate US Treasury Yield Curves. 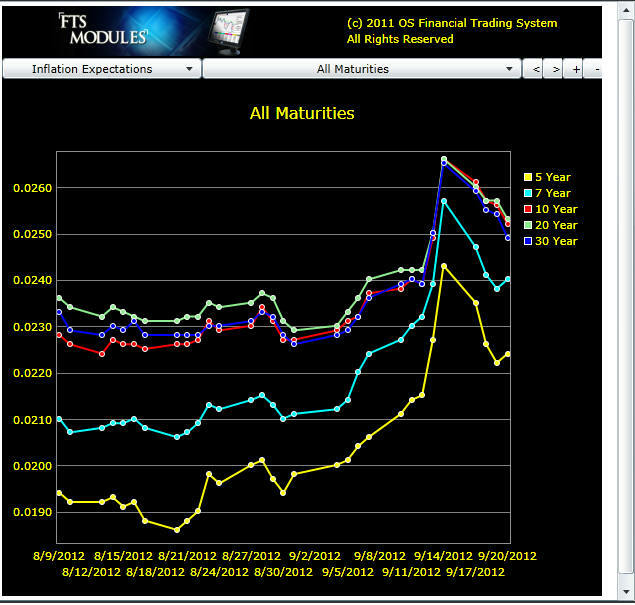 These graphs provide the current implied expected inflation rate by time to maturity. In addition, both the recent 20-day moving average and its two sigma bands are plotted. These graphs move forward with time and so for your interest we also graph the actual results around QE3. Important: You need to view this graph using a 32-bit browser (e.g., Internet Explorer, Firefox, Chrome etc.,). It will not display in Internet Explorer 64-bit. But you can view the static graph below for the answer to the question posed. Terminology used in this graph is defined after the graph. The inflation adjustment can be used to compute what the implied nominal rate for the same maturity (e.g., 5-year, 7-year, 10-year, 20-year and 30-year). The moving average plus the two-sigma bands are provided in the chart. How do I read off the inflation expectation numbers from the graph? Just hold the cursor over any one of the plotted circle points on any of the graphs. You can resize your browser if the circle dots are too small. What happened to Inflation Expectations around QE2? From the above chart you can see there was an immediate sharp increase which has already started to fall away. The moving average charts available from the specific time horizons (e.g., 5-year, 7-year, 10-year etc.,.) provide additional details about underlying trends. Copyright � 2011 OS Financial Trading System. All Rights Reserved.